Bruchac is an experienced hand when it comes to storytelling, with over 150 works for adults and children and have thirty years of publishing experience. His works primarily focus on his Abenaki heritage and other Native American traditions. Killer of Enemies is science fiction that doesn’t root itself in alternative history, but a Dystopian futuristic world. The super-rich and powerful had access to the best technology had to offer. Nanobots enabled many of them to become physically perfect and near-immortal. Giant monsters were bred with DNA splicing for their personal menageries. And none of them paid any attention to the rest of the 99%, who were barely getting by. Until a mysterious electromagnetic Cloud arrived from space, which enveloped the Earth and short-circuited all advanced technology. Most of the cyber-enchanced elite are killed instantaneously. The world is plunged into a post-computer steam age. Flash-forward a decade later post-Cloud and we meet Lozen, a 16-year old Apache woman whose job is to stop the genetic monsters left behind from killing off the surviving human population. She and her family live under martial law in a compound in the American Southwest. It’s one of the “safer” places for humans to live, but the place is also controlled by a set of four deranged former One-Percenters, all suffering mentally and physically from the aftereffects of having their tech-infused faces blasted apart. Daily life is a struggle as Lozen is sent on dangerous missions on the whims of any of the Four, while she worries about the safety of her family until the cruel watch of the compound’s militiamen. The structure of the book is fast-paced and told in the present tense from Lozen’s POV, which is a popular young adult writing style. This style also doesn’t leave Lozen or the reader much time for explanations until after the first few chapters. While the opening battles are gripping, I’m also a bit frustrated by the lack of background information that I slowly gathered upon her return to the Compound. Lozen is a fully-fleshed out protagonist, whose stoic appearance belies a rich inner world tinged with dark humor. She is tough and doesn’t pontificate much because she doesn’t seem like she is ever in a position long enough to pontificate. Supernatural occurrences are taken in stride by the pragmatic Lozen. Like how the sky is blue, the world is in ruins, and the super-rich are now super dead, she doesn’t question finding springs with healing properties and befriending creatures older than human civilization straight from her ancestors’ tales. Bruchac weaves in Apache religious beliefs and folklore into the world that reads as authentic and that doesn’t make Lozen into a “magical Indian guide.” In fact, I appreciated how her skills and background as a fighter doesn’t draw upon some mystical sense of heritage, but because her father and her uncle were lifelong military brass and passed on their knowledge of top-grade weaponry as well as their cultural beliefs to Lozen. Thus, Lozen’s personal experiences don’t feel type-cast because of her racial background; they are markers of a pragmatic survivalist in a world plunged into chaos. There are also aesthetic references to Alice in Wonderland, Neil Gaiman’s Sandman, and first-person shooter games throughout, making the book entertaining to read outside of its steampunk elements. The characterization of the secondary cast didn’t feel as strong, though. Her family and her love interest, the gentle gardener-musician Hussein (yay for interracial relationships between two people of color), while significant to Lozen, don’t get as much screen-time as individuals. The Four who rule the compound and their militiamen are pretty much cartoon villains, though it is still satisfying to see them get their just desserts. There’s also another character in the book on the more mythical side, who felt very uneven. One way of interpreting Killer of Enemies is that the book is one long video game where Lozen has to continuously level up, and her bosses become more and more formidable with every round. It makes for thrill-seeking reading. I wonder, however, if the video game mentality didn’t let me feel settled in the world that Bruchac builds. Another point I want to highlight: I appreciate that the book is self-contained and doesn’t fall into the “trilogy trend” of YA. As Lozen says at the end, “All I can do is put one foot in front of the other and see where it leads me.” I didn’t get a strong sense of closure for Lozen or her family, however. The book’s ending felt like a save point, not a resolution. Still, despite its weaknesses, I enjoyed what Killer of Enemies offers as a fun and quick read, and the potential it has as an expansion of the steampunk genre. Killer of Enemies is currently available from Tu Books. Sounds pretty amazing! 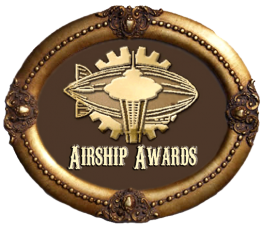 I’m with you – I’ve read some steampunk books where the steampunk elements are more like props. Just for asthetics. I need steampunk to be more. I am an adult that has found great entertainment in YA writing since most authors in YA do present a more action based agenda than typical mainstream fiction writers. I suspect it is to hold the interest of young minds who may have, as Ay-leen the Peacemaker states, a videogame attention span. I like that ATP highlights how in-depth the protagonist of Killer of Enemies is written and I cannot wait to put this book on my reading list. Great review that has me looking forward to reading a book once more. bbut after looking at some of the posts I realized it’s new to me. find high-quality writing like yours these days. I honestly appreciate people like you!